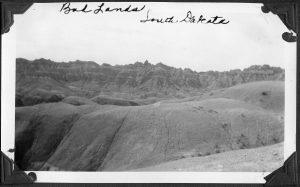 Monday June 18 – Badlands National Park in South Dakota is about a 60-mile-long arc stretching west to east while only 3-4 miles across in many areas. Most of the park experience is done along the 25-mile “Badlands Loop Road” in the western part of the park. About half of the loop route is “above-the-rim” and half below the rim. Our internet searches suggested that the Canata Basin Overlook was where Earl and Ethel’s took their picture. While this overlook got us to the right general area, we found its elevation too high when compared with the scenery in their photo. We found locations very similar to their photo about a mile to the west. Although we may not have captured an exact matched location, we felt we got very close. High winds and rain became a factor and nothing we were seeing looked close in the rest of our ride along the Loop Road. 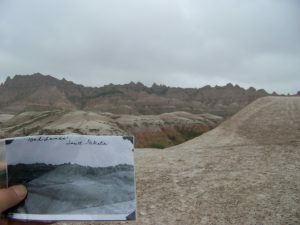 The attraction of the Badlands is the result of the ever-changing landscape caused by wind and erosion. The amount of erosion may also have changed some features, but we feel not to a great extent. Fort Thompson SD is the located about 25 miles north of Interstate 90 and in 1937 off then US Hwy 16. It was and remains the tribal headquarters for Crow Creek Sioux Indian Reservation. We drove to the Tribal government offices to see if anyone had insight on where the picture was taken. 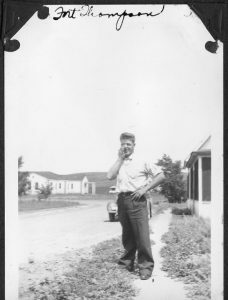 The thoughts were the photo was taken in front of the old Post Office which was located in a separate room of a private residence. Verifying this will require additional looks in photo archives or finding another local historian connection. This is because the old village of Fort Thompson is now under water as the result of an early 1960’s Missouri River damn project by the US Corps of Engineers. 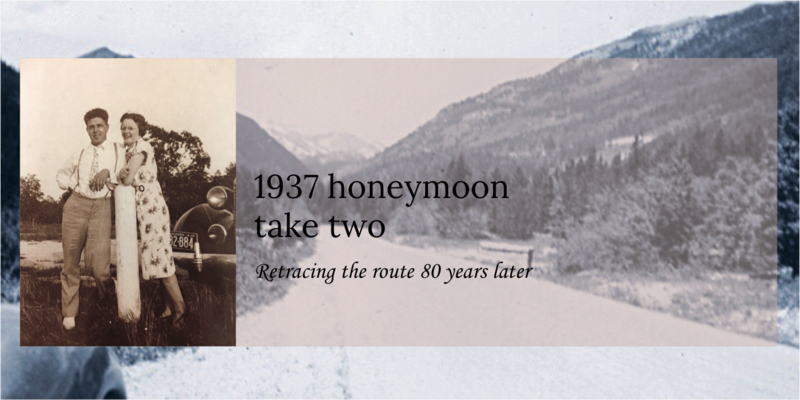 Understanding why Earl and Ethel took this route off the main highway is an even greater curiosity now than before we drove there. 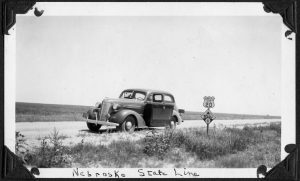 There were plenty of traveler services available in the city of Chamberlain which Hwy 16 ran through in 1937. Had they made a wrong turn in Chamberlain? We may never know. Carl did enjoy the conversation and hospitality of his visit at tribal headquarters. 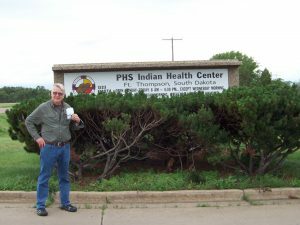 He met a tribal member there who had worked with many of the same agencies and programs that Carl had from 1975 through the mid-1980’s when Carl worked for the Oneida Tribe in Wisconsin. The two shared quite a few laughs with this connection. We took our “duplicate” photo in front of a sign for the Tribal Health Center for the relocated Fort Thompson. This photo of Earl is the last photo in their honeymoon album until they return to Wisconsin. 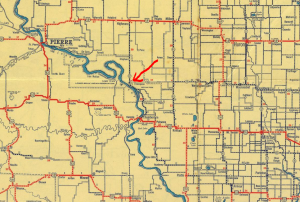 1937 South Dakota map showing location of Ft Thompson. We’re not really sure why they made the turn north after leaving the Badlands? Hwy 16 would have brought them into Minnesota.